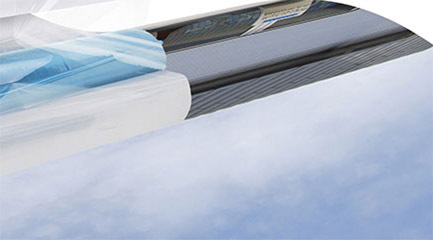 Our single belt film casting systems offer a range of benefits including ultra-efficient continuous production and the ability cast very thin films to fine tolerances. This process can also be used to produce microporous membranes of a quality unattainable by any other method. In this process, a polished steel belt is coated with the liquid product. The cast layer is then transported on the belt through a series of carefully controlled phases (usually involving heat and mass transfer). Once these processes have been completed, the solid formed product is removed from the belt. At this stage the product will be in either final or ‘green’ form, the latter requiring further processing such as leaching or directional orientation.